As Andrew pointed out in the comments to F1 Fanatic's race report, Melbourne 2008 was almost a re-run of the Canadian GP of 2007. Perhaps this was a consequence of both tracks being "green" but I think it is safe to say that, like Canada last year, Australia 2008 will prove to be an anomaly. Certainly, most of the drivers must be hoping so! Nelson Piquet would be one, without doubt. His performance throughout the weekend was pretty dismal and may well have earned him one of the famous Briatore "encouragement interviews". In his defense, I would suggest that he may not have been entirely to blame. As over-hyped as he may have been, his ability cannot be as poor as the difference between his times and Alonso's makes it seem. We should remember that he is definitely a lower priority in the team than Alonso, regardless of whether there is an official number one or not. There is a strong possibility that Alonso demanded certain guarantees from Renault before signing his contract, guarantees that McLaren would not give him but he regarded as his by right. I have no doubt that he will have asked for and received secrecy of the settings applied to his car, for instance. And that would leave Nelson having to learn the game from scratch. Fair enough, we might think, it is only fair that a rookie should begin at the beginning. But we should also be a bit more understanding when that same rookie tends to flounder a bit in his first few races. It is hardly surprising that, after damaging his car very early on in practice and getting very little track time as a result, Nelson should struggle with an evil-handling car in the race. So let us give the rookie a bit more leeway and delay our criticisms until he has had a few more races. His position is difficult and it remains to be seen whether he can learn quickly enough to prove his talent. In that struggle, he has a couple of factors going for him, however, the first being the fact that he is effectively paying for Renault to employ Alonso. The rumored information that Nelson has his seat thanks to the insistence of a major Renault sponsor, Carlos Slim, should ensure his tenure at least for the season. And then there is the factor that was absent from the Australian GP: Nelson's father was once known for his ability to develop and set up a car. If the old man is prepared to get stuck in and help his son, Nelson's learning curve may be shortened somewhat. Having seen the disaster that was Nelsinho's debut, Nelson Sr must surely be spurred to action - I would not be surprised if he becomes a fixture in the Renault garage from now on. It is not much to set against the mountain now facing young Nelson, however. If he manages to emerge from the season with at least a modicum of honor, it will be an achievement indeed. And I, for one, will not kick him while he's down. This will be one of the true tests for a driver, or any athlete: how mentally tough is he? Does he crumble or does he, like Kimi and Heiki, put his head down and push on? I believe it's called "character building", Arnet. And, at this rate, I think Piquet Jr is gonna turn out to be one helluva character! I would never pass judgement on a driver after one race. All the success that he has had before counts in my book. I would not put it past Flav on making a deal with FA. But did they have to make it so obvious. NP's father I am sure did not show up to the race for a reason and we all wondered what that reason was. Clive, your assessment makes sense. We need to see how he shapes up in the next couple of races. He is a competitor who knows racing and set ups he will soon know that his set up is not correct and with his personality he will not put up with it. NP jr has a future in F1. Flav may have not found the patsy he wanted I hope. The differences in the cars' setups was plain to see for everyone. NP is taking flak in the press and it is not as deserving as they portray. I am glad you wrote this piece Clive because I am sure a number of us were thinking the same thing. I am actually surprised that Alonso (isn't he paid something like $46 million?) even managed to finish fourth. Well maybe because both the Ferrari's did a good job of bungling this whole weekend. While Nelson has a long way to go, my drivers of the day were Kubica and Bourdais. It's unfortunate that they couldn't end up in the podium. Yes, that's the rumor, Barry - and $46 million is much more money than Renault would pay any driver so it has to be funded by Carlos Slim. I will grudgingly admit that Alonso went some way to earning a decent wage packet with his driving in the Oz GP and I'm sure that he was a part of getting the car to the point where it could pick up the points thrown away by others. But it seems a tad unfair to let Piquet sink or swim in the meantime. Interesting picks for drivers of the day. I would have to go for the three that finished on the podium - they survived the carnage and made it look easy. "When rookie Nelson Piquet Sr muscled into an established F1 team in 1979, he blew the socks off his double world champion team-mate [Lauda] . Can history repeat itself?" It should be noted that Sr's starting position in his first race was 21st. And Piquet Sr failed to finish that first race. Is history about to repeat itself...? I spoke with Nelson before the race yesterday and he was guarded then as to whether or not he would actually finish. But then on a day when 14 other vastly more experienced drivers did not, then I think we can cut him a little slack ! That was a hell of a race though, and I think Alonso's drive was better than some are giving him credit for. Sure there was a lot of attrition that undoubtedly helped but that fight with Kovi at the end was great racing and what I expected from Alonso - or maybe I am biased as Fernando posed for a photo with me last night and I am rapt ! There is no doubt that Alonso's drive was one of the best of his career. 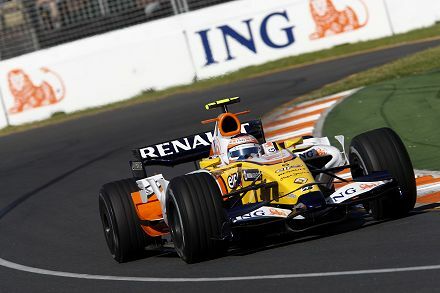 The Renault is no match for the McLaren and Fernando had to be on the ragged edge to stay ahead of Kovalainen. It seems he still has what it takes. It sounds like a very interesting day Pink Peril. I am sure that I read that Piquet senior was away on business this weekend. You can guarantee that if Alonso looks like making his boy look silly Nelson will be in the garage dealing with the press, winding up Flavio, slagging of Alonso etc. I expect him to make Flavio's life thoroughly miserable and to undermine Alonso. The Pink Peril has sent me an account of her experiences at the GP, Steven, and I will be posting it within the next couple of days. And then there are all the photos she sent as well - I'll be using some for her article and feed others in over the season. Melbourne - or so I have heard - is unique in the opportunities for the fans to interact with the drivers and we spent a lot of time getting autographs, photo's, and chatting with them. It was great actually, as it was usually the same people hanging out day after day so we got to know them a bit. We also had a security guard who was a riot, so there were a lot of laughs from a fairly raucous crowd. Most of the drivers love to ham it up when they get the chance and were really good about hanging out with us for a few minutes here and there. Even Kimi came over to sign a few ! (he didn't smile though). Lewis has to be the most generous - he not only signed every time he came out but signed every single thing put in front of him, posed for photo's and was happy to chat to everyone. Mr Pink shook his hand, and I fear will never be the same again ! And Lewis' dad is just as nice, he signed almost as many autographs as his son and was lovely to speak with. It's kinda funny how Anthony is now a celebrity in his own right ! But Fernando is still my favourite ! As regards to the race, well what a corker that was hey. Well worth sitting out in 40 degree heat and losing my own body weight in sweat for ! I was really chuffed that Nico got on the podium, as well as Quick Nick. We got some great shots of the podium Clive - I'll send them over later. Do you know I watched that whole race. The first time I've done that in maybe a decade. I hope MotoGP is watching. Fascinating stuff, Peril - we all envy you like crazy! And there is hope yet for the Oz GP it seems - a decision to be made later this year and there are signs that a compromise may be reached. I was disappointed in Nelson Piquet Jr's Saturday performance (Friday sounded like it was bad for just about everyone), but I think Timo Glock ramming Nelson at the start of the first-corner incident had a lot to do with Piquet Jr's inability to make amends later on. From here, he could be another Kovlainen - or a failure. There simply wasn't enough information given this weekend to tell. Glad you enjoyed yourself, Pink Peril. Yes, it does seem that Piquet's car sustained some damage in the first corner incident and he was driving at a disadvantage for the rest of his race. So no Briatore bashing for young Nelson after all!